San Diego State University’s Mens’ Basketball team wins both of this weeks’ match-ups, improving to 7-1. SDSU is continuing to stay hot behind 5th-year Senior PG Xavier Thames. With a favorable schedule over the next couple of weeks, the Aztecs could be looking ahead to Kansas with an 11-1 record. It has not come easy though. On Thursday night, the Aztecs saw a tough matchup verse University San Diego in a cross-city battle at the Jenny Craig Pavilion. SDSU seemed to have control of the game through the majority of the second half, but seemingly could not put the Toreros away. USD always seems to play tough, as SDSU had dropped 4 of 6 all time at the Pavilion. State’s shooting from the field seemed to be cold in the first half, and they had plenty of opportunities to put the game away. San Diego native Johnny Dee led the Toreros with 22 pts, hitting plenty of threes to keep USD alive. It took a 3-pt miss as time expired for SDSU to preserve the win. A win is a win though. Xavier Thames led the way for the Aztecs with 17 pts and got help from Winston Shepard and other role players. 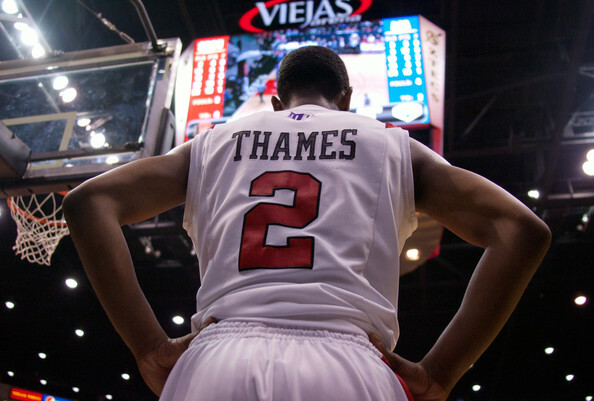 Xavier Thames has been the most consistent scorer for the Aztecs this season. When SDSU has been cold from the field to start the last few games, Xavier Thames would break that ice. He led the Aztecs with 19 points verse the Washington Huskies to help get the W.
Xavier has been playing extremely well all season. He consistently makes clutch shots, and is developing into a real go-to playmaker for the Aztecs. He currently ranks #16 in the entire NCAA for 3-pt FG% at 56.7.%. Although he may not be able to keep this up, the help of our big men and role players has really helped out. Winston Shepard has also been coming alive of late scoring 17 points Sunday, and 14 on Thursday against San Diego. He keeps showing his talents and potential, and is really coming along with the mid-range jump shot. Winston hit his last 5/6 free throws in the closing seconds verse the Huskies to put the game away. Another key contributor against Washington was Skylar Spencer. Coming off a 12 pt 6 reb game verse the Toreros, Skylar added 6 pts and a career high 5 blocks verse Washington. Last year, Spencer set a Mountain West Freshman record for blocks, and continues to show his defensive skills. Further developing Skylar’s offensive game may be key to Steve Fisher and the 2013-14 Aztecs. Against Washington the Aztecs played with a lot of size. They often played a O’Brien-Spencer-Davis line up as the 3-4-5. Putting O’Brien at the Small Forward position presents huge matchup problems for teams, and will be extremely beneficial in Mountain West Conference play. J.J. Obrien has not been too hot of late, but that is mainly attributed to his injured right hand. It has not been made public what his exact injury is. He had a very poor offensive performance against the Toreros, going 0/10 from the field, and continued that against Washington starting 1/8. You can tell he is very limited with the injury, but his size and defensive presence make all the difference. Once we get J.J. back on board, Aztecs should see their offensive woes clear up. Looking forward, SDSU plays 3 very beatable teams at home before opening up Mountain West play at Colorado St. Following the Colorado St. game, the Aztecs travel to the Allen Fieldhouse to play Kansas. Even though it is 4 games ahead, SDSU could see themselves 11-1 in a decent matchup vs #6 Kansas. SDSU seems to be in line for yet another exciting season!